The shimmering of five viols filled First Church in Cambridge Friday night as the Boston Early Music Festival opened its 27th-concert season, hosting the English viol consort Fretwork. Soprano Suzie LeBlanc joined them in just over half the evening’s 19 selections, by four English composers of the late 16th through the late 17th centuries: William Byrd, John Dowland, Orlando Gibbons, and Henry Purcell. 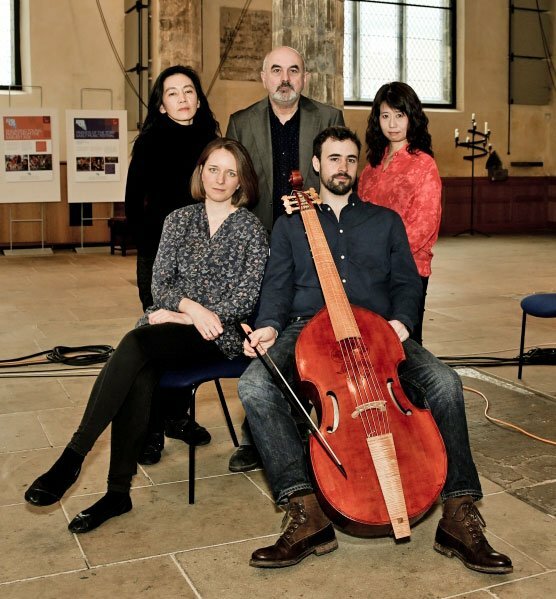 In pre-concert remarks, bass viol player Richard Boothby traced the 30-year history of Fretwork., Having long admired their recordings of music written for the instrument known alternatively as the viol or the viola da gamba, I had been eager to hear them. A sizable repertoire exists for combinations of two to seven such instruments, which differ from members of the violin family in the greater number of strings (six or seven) and the use of frets (hence the name “Fretwork”). In addition, all sizes, including the smallest or treble viol, are held upright in the lap or on the knees, rather than on the shoulder. Cultivated by wealthy amateurs in early modern England, the instrument was revived in the 20th century, when it again became a favorite of amateurs. Perhaps Boothby was right to complain that, before Fretwork’s founding, viol playing often functioned at a “low level,” with “painful” intonation and questionable coordination of ensemble, even though Fretwork had been preceded by fully professional groups, such as the Jay Consort of Viols and various ensembles directed by August Wenzinger (teacher of Jordi Savall). Still, it proved exciting when, during the 1980s and 1990s, Fretwork released recordings of Byrd, Purcell, and their contemporaries that rendered this music with expression and drama where it needed to be, yet always clear and thought-out—and with impeccable tuning and ensemble. Of the five players present, only Boothby who has been a member of the group since the beginning, is represented on one of those CDs. The players we heard achieved near technical close perfection, but the verve and clarity that marked earlier recordings was not always evident. Suzie LeBlanc, whom local audiences know from her appearances in BEMF-sponsored operas, meshed perfectly with the viols, which is to say that her singing shared their good points as well as some less admirable features. One problem arose from the almost uniformly serious, even solemn, character of the selections. The vocal numbers focused on death, mourning, and philosophical resignation. The instrumental selections sounded equally reserved—among them seven fantasias and related pieces of which all save one were in minor keys. All four composers wrote dances, but we heard only three by Dowland—again, all in minor keys and none of them really fast, let alone light-hearted. So dark and reserved a program might have been more successful had there been some variety in the approaches taken to these selections from four generations of composers. But singer and players seem to have striven for the opposite, settling for an almost uniformly quiet manner appropriate, nevertheless, for many of the selections. Of course viols are quiet instruments, or so we are told. But Fretwork’s own recordings demonstrate how much can be done with timing, articulation, and varied types of attack, and a singer is free to express the same. Byrd and Gibbons, whose music has much in common, occupied the first half, Dowland and Purcell the second. The first of four consort songs by Byrd, “My mind to me a kingdom is,” started auspiciously with its light rendering of a witty Elizabethan text. But here and in “Constant Penelope,” “Content is rich,” and the elegy “O that most rare breast” in memory of Philip Sidney, as well as in Gibbons’s famous “What is Our Life?,” LeBlanc evidently strove more to blend with the viols than to project details of the vocal lines. Even in the first-row seat provided to a reviewer, I could not always hear the words, especially at the ends of phrases, which tended to drop off. I was curious to see whether my impressions were due to the acoustic of the hall at my assigned seat. So for the second half I moved to the balcony at the back of the church. There I was pleasantly surprised to hear singer and players at least as clearly as in the front row. But even the stunning modulations in Dowland’s “Lachrimae tristes”—the fourth of the seven “Lachrimae” (tears) pavans—received no distinctive response from the players. It might have seemed a good idea to use this example to introduce Dowland’s famous song “In darkness let me dwell.” But the latter was, as Boothby admitted, “turned into a consort song.” It therefore sounded just like the preceding long, slow piece in the same key. Moreover, distributing the lines of the original lute accompaniment among four viols makes explicit what the composer only meant to suggest. It also locks the singer into a somewhat stricter rhythm than otherwise. The very slow tempo taken for both numbers may seem appropriate, and the performers were impressive in maintaining a beautiful composure throughout; playing and especially singing in this manner is taxing and difficult. But I missed hearing the second of the song’s two stanzas, which was omitted. And I wonder whether the references to “hellish jarring sounds” and other poetic images could not be interpreted more forcefully at a slightly less funereal tempo. Some measure of liveliness returned in two galliards by Dowland, known as Essex’s and Noel’s—the latter in its little-known vocal version, “Shall I strive.” But the high point came in the concluding set with four of Purcell’s fantasias in four parts. These astonishing, at times almost expressionistic, works—from a set of 18 or 19 pieces for as many as seven viols—received more nuanced execution than others we heard. Most touching was perhaps no. 6 in F major, where perfectly timed pauses brought out the shattering transition to the minor mode at the beginning of the slow middle section. Also heard were nos. 12, 7, and 8, in that order, the second of these colored by Fretwork’s unflinching execution of the many cross-relations (a type of dissonance favored by English composers). What might have been a disaster, a broken string on one of the bass viols, occurred in a “timely” fashion, as Boothby observed wryly, at the very end of no. 12. This occasioned a little re-ordering of the remaining numbers, which the performers took in stride. Stock shot of Fretwork with Richard Boothby top and center. To these ears, the arrangements of all three of the Purcell songs were even less convincing than the Dowland one. “Music for a while,” “O solitude,” and “The Evening Hymn” are all “grounds”: compositions built over short repeating bass lines. The arrangements were played perfectly well, but at times they left the bass line inaudible, while distracting attention away from the voice and toward Boothby’s added counterpoint for the treble viol. Seventeenth-century viol consorts may occasionally have substituted for lute or harpsichord in accompanying such songs. But, juxtaposed against Purcell’s own striking harmony in the fantasias, these arrangements had a faux quality. For better or worse, these selections too were changed, anachronistically, into consort songs and performed with the same still beauty as the remaining ones. BEMF most considerately printed the complete texts of the vocal selections—including stanzas that were not in fact sung (in the strophic songs by Byrd and Dowland). On the other hand, I wonder whether we really needed three pages about the performers when little more than a page focused on the music. Boothby chose not to use his pre-concert talk to “expand on” his rather minimal essay, rather providing a talky history of the group, including the now-unavoidable call for donations. Perhaps few in the rather sparse audience needed it, but surely some would have found it helpful to be reminded that an “In nomine” was based on a melody from a mass by John Taverner, and that composers competed in writing virtuoso settings of that melody; or that Purcell wrote three of the program’s four fantasias within the space of eight days, the fourth following a few weeks later during the summer of 1680. Particularly when a program as is abstract as this one, it can be alienating for a less experienced listener to be confronted by puzzling titles (and more-puzzling music) without explanation. Would it hurt audience retention to insist on more informative but perhaps optional talking before the concert, especially if there is no space for proper notes in the handout?